The 2018 Ford Mustang is a vehicle with a ton of history, and a ton of power, to offer. With a legacy of power and performance, hidden underneath a sleek and strong profile, the new Ford Mustang is designed with your enjoyment in mind. Continue reading to learn more about this amazing legacy performance vehicle! 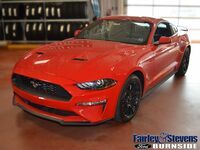 As mentioned above, the 2018 Ford Mustang is a vehicle that has a ton of power and performance, and it does so through its strong engines and amazing performance features! These engines offer a ton of power, giving you excellent performance on the track and on the road. The first of these engines is the available 2.3-liter EcoBoost® I-4, which can deliver up to 310 horsepower and 350 lb-ft of torque. A second engine available for the new 2018 Ford Mustang is the available 5.0-liter Ti-VCT V8 engine, which allows it to access up to 460 horsepower and 420 lb-ft of torque. Combined with these two engines, the new Ford Mustang also features a 10-speed SelectShift® automatic transmission, which allows you to get the most out of your engine's power and performance. In addition to having exceptional power and performance features, the 2018 Ford Mustang also has many exceptional seating options! This includes heated and cooled leather-trimmed power front seats, giving excellent comforts no matter the climate! The 2018 Ford Mustang also has a ton of excellent infotainment features, including the ability to link your phone to your vehicle and access all its amazing features and applications. In addition to its many infotainment features, the 2018 Ford Mustang also has a ton of technology features to offer you! This includes a 4G LTE Wi-Fi hotspot, which allows connection of up to 10 devices to your vehicle! If you want a vehicle that is designed with your need for power and performance in mind, look no further than the 2018 Ford Mustang! This sports car is perfect for tackling the track or the road and doing it with style! Contact us at Fairley & Stevens Ford today!